A: Because the sea weed! Because of my recent keratin treatment, hair products aren’t something I’m experimenting too much with at the moment, so I invited another blogger (and my lovely housemate) McTofu to try this one out for me. “One advantage of living with a beauty blogger is that quite often some lovely products come my way. 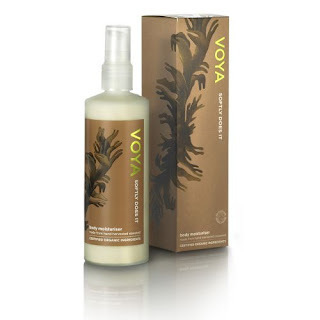 One such product is Voya ‘Forget Me Knot’ organic conditioner. Made from hand harvested seaweed, I was expecting it to smell of the sea, but no, it had a pleasant spicy, woody smell. Now, I’m a gal that is used to sweet smelling hair products, so I was not overly impressed with the scent when I squeezed a 50p sized blob onto my hand. The instructions for this product say to leave the conditioner in place for 15 minutes, another housemate has tried this product too, and really liked it, and she also commented on the unusual and pleasant smell. Both testers have coloured and porous hair, the conditioner (which I’d actually consider more of a mask than a daily use product, owing to the long time it’s recommended to leave it in place) is very thick, rich and seems to be really suitable for dry, coloured and/or processed hair. I tried these, and I really liked them. The shower gel is a clear gel-product, it doesn’t lather overmuch (due no doubt to the lack of SLS and other nasties) but leaves you feeling fresh and clean and delicately scented with the unusual, but very lovely, mixture of sweet basil and clove that the entire range has. It doesn’t appear to leave my skin dry, and I’m not flaky after using it. The body lotion is a medium-weight cream that I found took a fair bit of rubbing to absorb, but it’s not a chore to use. The scent does last, but not in an overpowering kind of way, so I don’t think you’d have too much trouble with clashing smells if you use this. The softening effect is lovely, and appears to last for a while. They’re definitely products I’ll continue to use! Voya products are available from http://www.voya.ie/default.aspx and start at around nine euro. 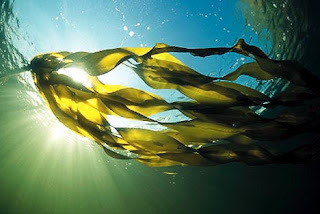 The range includes skincare, bodycare and haircare products as well as candles and teas … Seaweed teas sound kind of interesting, don’t you think? The small print: The products were provided free for review purposes. All reviews remain impartial regardless of the source. Next Post Nails – my new obsession! that hair mask thingy sounds good! !